The way I remember it, we all followed Ronde Barber to San Diego. One day, we were freezing to death in that tombstone-cold press box in Philadelphia, and Rich McKay was screaming at the top of his lungs, and Barber turned off the volume in the old Veteran's Stadium. The next, we were on our way to California and the Bucs' Super Bowl. It was 16 years ago, an eternity in pro football. And the damnest thing had happened. The Bucs, that whipping-boy franchise from the poor side of town, had made the Super Bowl. Bucs' seasons. It was cold and ugly -- they kept a window open in the press box for a camera -- and the Eagles seemed to have the Bucs' number. Two years before, the Bucs -- with one of their finest teams -- had blown a field goal against Green Bay. Instead of having a bye week and a home game -- the Bucs had to make a quick trip to Philly. They lost, 21-0. The year before, the game that would end Tony Dungy's career in Tampa Bay, the Bucs lost 31-9. In other words, Philadelphia always looked -- and felt -- like the end of the trail for Tampa Bay. It was like the Vet was the O.K. Corral, and the Bucs were the Clantons. I remember the first of those games. I was walking off the field, a half-dozen steps behind John Lynch. The crowd was booing, alive with their victory, flush with the 0pportunity to curse in an opponent's direction. Lynch stripped off his wristbands and looked for a youngster to throw them to. Finally, he found one, and he started to throw ... and the kid started to swear at him with a voice from hell itself. Imagine the Beaver being possessed. That's what the kid was like. This year, though, was different. The Eagles started off gangbusters, taking a quick 7-0 lead on a kickoff return and two plays. But in Jon Gruden's first season, there was something more dangerous about this Bucs team. After Tampa Bay cut the margin to 7-3, Joe Jurevicius caught a pass over the middle for 71 yards. 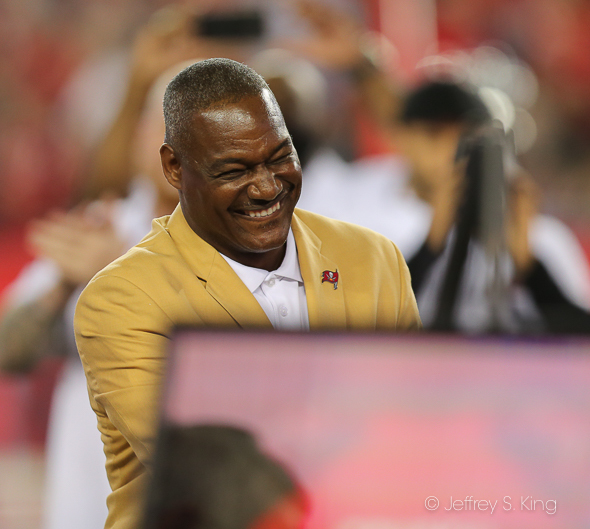 It was probably the best offensive play of the Bucs' history. Then, late in the game, the Eagles still had a chance. They were deep in Bucs' territory with a chance to cut the lead to 20-17. But with 3:12 to play, Barber stepped in front of Antonio Freeman and ran his interception back 92 yards as the crowd sat in stunned silence. All you could hear was McKay screaming. "Run, Ronde, run. Don't ever stop running." And in memory, he never has. If you want to tell the story of the Bucs' Super Bowl victory, this is where you begin. Not in San Diego, where the finish line was. But in Philly, where the Eagles thought they owned the Bucs. The Super Bowl was played only a week later. There was no bye week then before the big game. I remember flying back to Tampa and changing planes. My wife brought me another suitcase that was packed with warm-weather clothes, and we traded at the airport. While I was there, I grabbed a copy of the Times. There was a letter in the sports section suggesting that, because we picked the Eagles to beat the Bucs (I think everyone did), John Romano and I should be run out of town. Yikes. It convinced me that people were reading the paper who didn't always read it. Writers often pick against their teams. Otherwise, you're just being a homer. But I felt all week that the Bucs were going to beat the Raiders. Yeah, they had Rich Gannon and Jerry Rice and Tim Brown. But Gruden had infused a new energy in the Bucs. The Times sent a large group to San Diego for the game. In the group was Antonya English, who covered the Gators for us. Early in the week, she was doing to a media piece on foreign speaking outlets that carried the Super Bowl. She desperately needed the phone number for Fuad Reveiz. Now, Fuad and I were old friends from when he played for the Dolphins. We became close, and I had his number. So I gave it to Antonya. She was shocked that I had it at hand. I probably didn't have an active number for another player, but to her, I sounded well-connected. When you cover a Super Bowl, you work in a large room (the basement this time) with cubicles. The Times, as one of the newspapers from a participating city, had a cubicle. But I found a spot in the general public and set up shop. From there, I could answer the questions from my peers. Tuesday is Media Day, the biggest circus in sports. The NFL goes out of its way to invite everyone who dresses up as something -- a bride, a superhero, a football player, etc. -- to throw absurd questions at the players. Then there are those of us trying to do a decent day's work. I followed Keyshawn Johnson around for the day. He wasn't as brash as I expected, but there were several sound bites. Basically, Keyshawn talked about how much he loved playing for Jon Gruden. That wouldn't last. On Wednesday, I wrote about Warren Sapp. The town could not hold him. Say what you want about Sapp, who was larger than life, but he was an essential Buc player. What people forget was just how smart -- and funny -- Sapp could be. With an audience, he was a star. On Friday, I went to John Lynch's old high school and his neighborhood. Brad Culpepper used to say that he and Lynch had overcome prosperity. They were rich kids in a poor man's league. The year before, I had written about the Rams' Marshall Faulk and his upbringing in the Desire neighborhood of New Orleans. I wrote that he went to sleep with "gun shots in the distance." This time, I wrote that Lynch went to sleep with "golf shots in the distance. "It just shows great players come from everywhere. Lynch remains one of my favorite players; we joke that I was the first guy to call him "great" in a column. On Saturday, I wrote about the Glazers, and the money they had spent because they wanted to win. It isn't a stance I've taken often; they've had years they haven't spent anything. On Sunday morning, I wrote about Brad Johnson, the Bucs' quarterback who had outplayed Jeff Garcia and Donovan McNabb. Soon, he would outplay Gannon. Johnson was a better quarterback than you remember, but this was the streak of his life. And on Monday, I wrote that an entire town had taken over the personality of a football team. We were brash, like Sapp. We were smart, like Barber. We were sleek, like Derrick Brooks. We were tough, like Mike Alstott. We were resilient, like Jurevicius. We were loud, like Keyshawn. We were energized, like Gruden. Eventually, we would be become Josh Freeman and Bruce Gradkowski and Gaines Adams and Sabby Piscatelli and Michael Clayton. But on that day-after morning, such demons were a million miles away. On Tuesday, I wrote that it was the best single year that any coach ever had. Others had won in their first seasons, like George Seifert and Don McCafferty, but they had been on the previous staff. Gruden didn't even know his players. He won with a balsa-wood offensive line. He paid off the oversized debt the franchise had paid for him. Ask yourself: Would you trade all the misery that followed for one night like that one? Of course you would. Now, Gruden could have been better in the seasons to come. But for one game, he was terrific. And it lasts. Thank goodness it lasts. For 16 years, I've been writing about that team. It was such a blend of personality, including Simeon Rice -- who was from his own planet -- and Jurevicius and Alstott. Monte Kiffin was the mad scientist. I didn't get along with Dwight Smith. Kenyatta Walker despised me. The post-game interviews are a snarl after the game. They were held in large tents, with different players coming in. I talked to Sapp briefly, to Brooks. I exchanged pleasantries with Tim Ruskell and Rich McKay. I let Kenyatta gloat at me a little bit, as if he had become a great player in the win. All Super Bowls are cool to cover. It's where the stories are. I've been proud of pieces I did on Lawrence Taylor and Ray Lewis and Anquan Boldin and Joe Montana and Emmitt Smith and Wilber Marshall and others over the years. But I've always thought that the fleeting success that the Bucs had made their title sweeter. They weren't like the Patriots or Steelers or 49ers, where fans try to pick their favorite teams. This was a Cinderella moment. You never forget the days you spent as a scullery maid. I still think that team, and a couple before it, had another title or two in it. It would help Lynch get into the Hall. Barber. Maybe Rice. But they won it once. That was special. That was magical. That was something to see. All the years, and all the disappointments, don't change that. I remember that well. I read all the columns in the SP times about the bucs and some of yours twice. It was a magical time. Favre was hunted and Sapp got him, Vick was proved to be mortal, the curse of cold weather was gone, and we owned Philly. I miss that team. I think I will pop the dvd in and watch it with the popcorn ready. I may do the same. I didn’t think it was a great highlight film (not enough on the humble origins), but it was good game film. Thanks for the good memories. I hope this season brings us some more! Or at least start the memory machine. Right? Thanks for the walk down memory lane Gary. It was a special time for sure. I remember how before and after that Super Bowl everyone was buying Bucs shirts in my office. Venders and stores were selling them all over town. We had dress down days all the time so all the employees could proudly wear their Bucs gear to work. Everybody was a Bucs fan. We have had so few championship teams in this area which makes that Super Bowl win so special. It was a good time for all of us, wasn’t it. It was a likeable team, too. Previous post: Random thoughts: Want to bet what Brady eats?